I haven't written a "These Days" post in so very long. First of all my kids- who I used to refer to as "Littles" are not so little any more and along with age comes a desire for privacy. Also I just felt a lot of what we were doing wasn't too interesting to most people- I mean do you want to hear about swimming lessons and gymnastics? So anyways I haven't written about the biggest part of my life in over two years and I really miss it! These days you will find us doing the daily grind- after school sports- home reading- friends in one door and out the other- life is a constant whirl around here these days. My kids are turning into interesting people- ones that have interests in stuff like computer coding and baking- they know about things like the science behind why some people here Yanni and some people hear Lauren- like they had to explain the phenomenon to me! They are curious little creatures. Needless to say with all the activities (and we are far less scheduled than most families with kids our age) we miss the slow quiet days of when they were young. 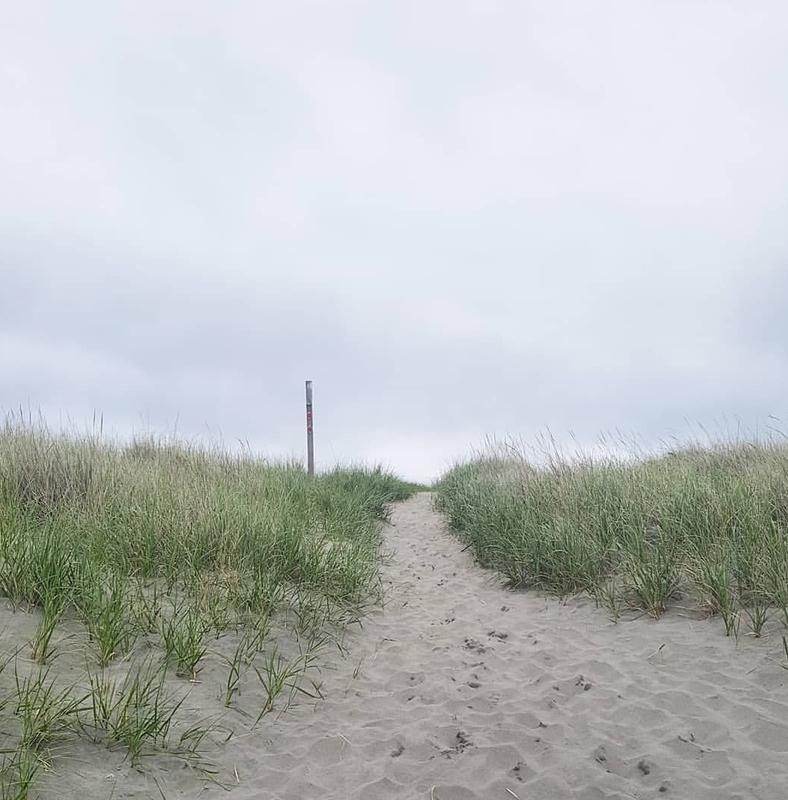 Last weekend when we all piled into the car and headed to the ocean they started to talk and we all started to reconnect. The Boy made our very eclectic mixed CD- tunes ranged from Fleetwood Mac to Justin Timberlake. The Girl told funny and really weird stories. It was nice to all be in one place with no other distractions besides someone randomly yelling out "COW" as we drove past farms. So these days we are parent's to big kids- the struggle is still as real and hard as when they were little but the demands are different. Less physical and more emotional. When I look back on the days when I first started writing this blog the hours seemed just so long and the days were so very hard. Now the days can still be hard but they fly by just so fast. From babies to complex young people in the blink of an eye! If you follow along with me over on Instagram then you likely have seen my flood of road trip posts- this past long weekend we hit the road and drove down to Long Beach in Washington for a mini getaway with friends. 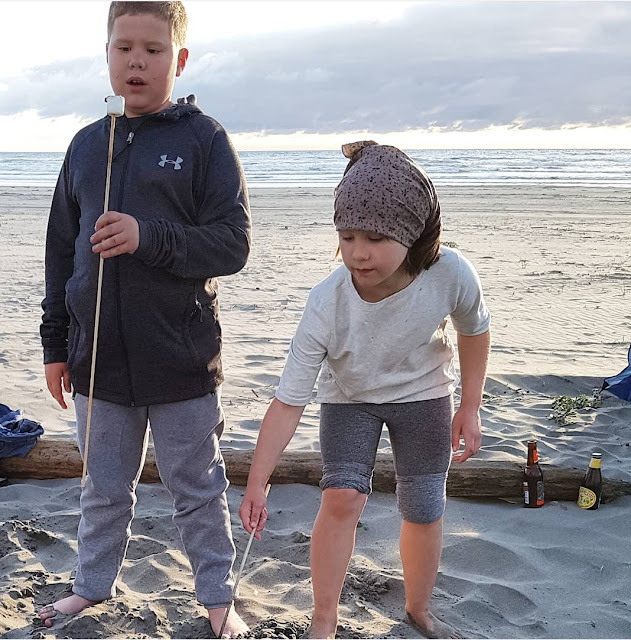 It was great- everything we needed as a family- unwinding time for all (except the Mr. who did all the driving- the man is a saint) plenty of beach hangs, camp fires and erm adult beverages. On our way home it was decided that we would avoid Seattle and head through the interior- conveniently right by one of my favourite yarn shops- Tolt Yarn and Wool! When we lived in Vancouver visits to Tolt happened on the reg- these days not so much. I haven't been in two years! So while I could have easily gone bananas and bought everything I laid my eyes on I intentionally just slowed it way down and took it all in. 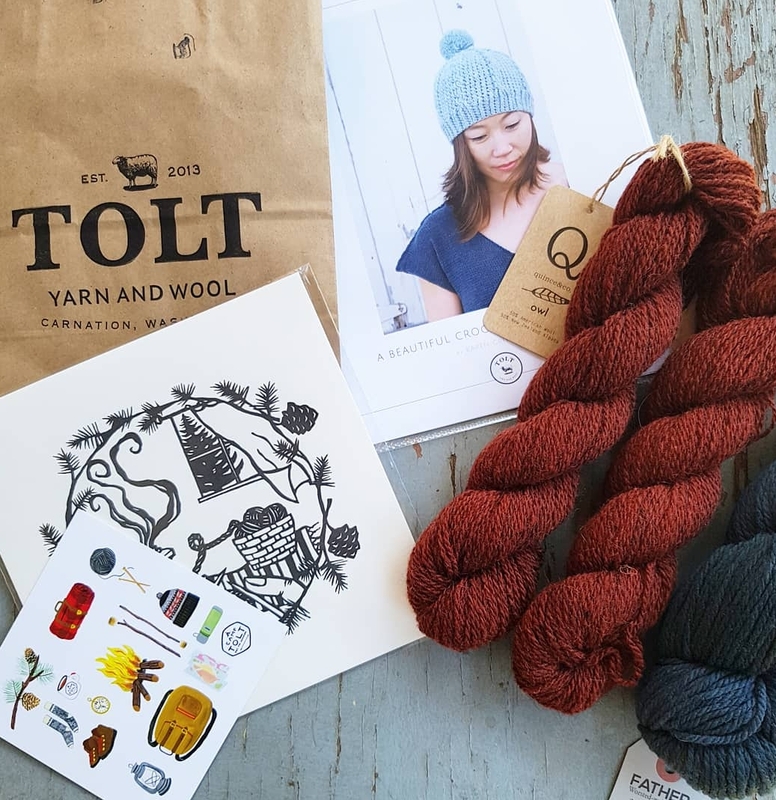 I touched everything and got an idea of what new to me yarns feel like- I may have walked around squishing a skein of the new Ranch 01 from Brooklyn Tweed. In the end though I contained myself and came away with some really special yarns- two skiens of Quince Owl in Mesa- a gorgeous worsted weight. Destined to be crocheted (yes you read that right) into the Strossel hat by Karen Crittenden. 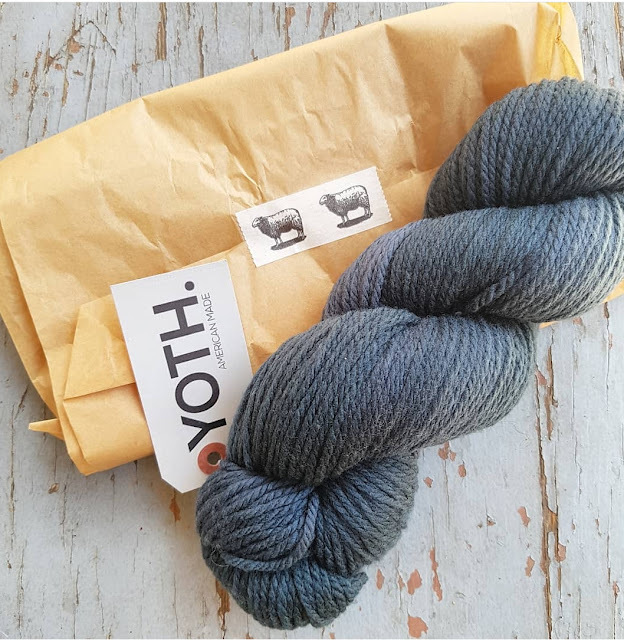 I also brought home one skein of Yoth Father- another worsted weight yarn in a deep indigo colour called Caviar. I love Yoth yarns and never miss a chance to add to my stash! Additionally I treated myself to some knitting art- a letter press print A Sense of Place by artist Anna Brones. As soon as I saw this print I feel in love- two of my favourite things combined knitting and printmaking! I don't purchase many souvenirs when I travel but yarn and art are two things I find difficult to pass up- both reminders of the roads I've traveled. When the time comes to work with this yarn I will forever remember the sticky hot day we stopped- my family hanging out at the van with the side door open- my Mr. peeling apples for a snack- the kids picking all the chocolate out of the trail mix- waiting patiently as I touched all the yarn! 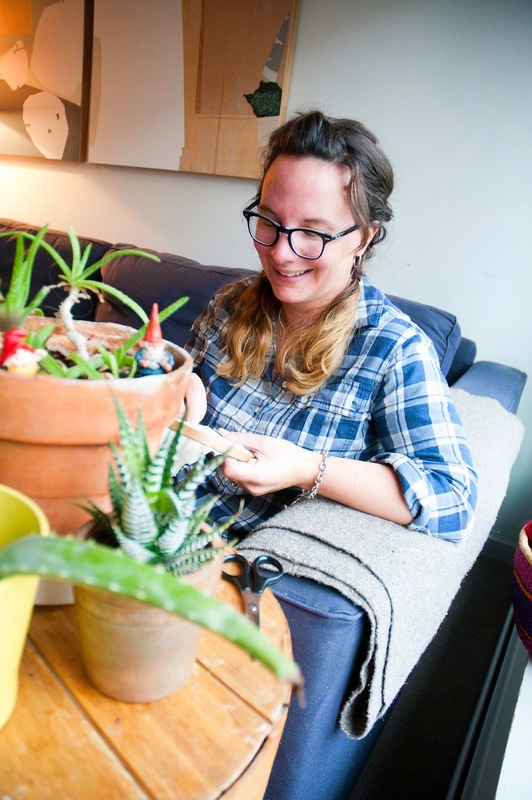 Now I really don't want to sound like a broken record when I say there are things about living in Vancouver that I really miss- loads that I don't - but a few things living in a big city provides that just don't exist in a smaller place! One such place is the Pandora's box called Maiwa Supply- a veritable treasure trove for a textile artist or even just someone looking for a little inspiration. Maiwa is what I consider to be ground zero to the slow fashion movement- with 30 years of experience in supplying natural dyes and organic fabrics. Maiwa is a family run business and you can feel that the moment you walk through the doors- they aren't in the business of just selling cloth but in the business of creating memories and some of my strongest Vancouver memories are tied to the little shop across from the bakery. My first visit to Maiwa was in the early 2000s- fresh to the city Granville Island was my home base. I was working on the island and had heard the buzz- people told me "you just have to go" and I'm so happy I did! Walking into the store was like nothing I had experienced before- the store just resonated with me deep in my core- I didn't know how to use any of these lovely things but I wanted to learn! Maiwa was the place I went when I became obsessed with crochet- back then they had a small selection of naturally dyed yarns- I heard words like Madder and Indigo for the first time outside of art supplies. Maiwa was the place I went when I was pregnant with my first child and wanted to sew baby clothes- choosing from the soft block printed fabrics I knew my baby was wrapped in something special. And Maiwa was the first place I ever heard the words Slow Fashion- learning the difference between industrial cotton and organic cotton. Where I really and truly began my own textile education. I truly miss the days of realizing I need something for a project and having this resource just down the road. 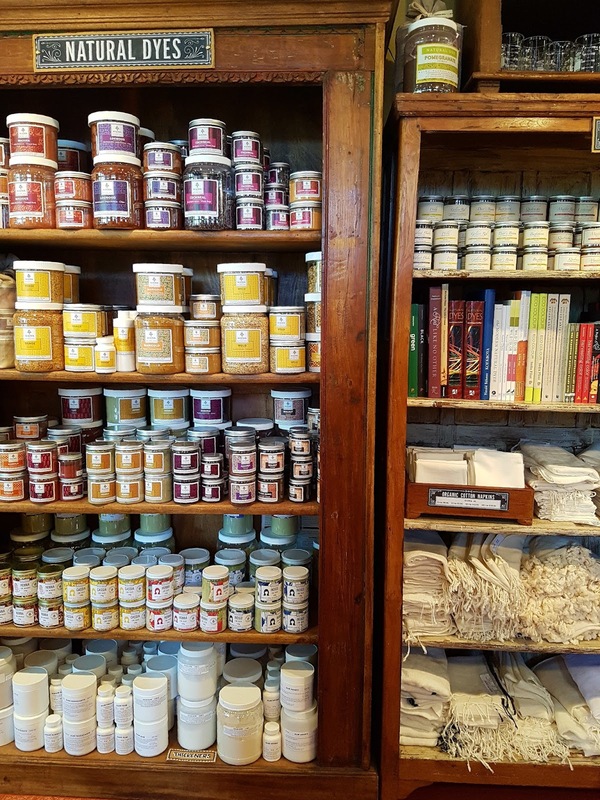 Their staff are amazing and always so helpful trouble shooting or filling in the gaps in my natural dye knowledge. While Maiwa does have a pretty great website there really is nothing quite like ducking through those blue doors to touch and feel everything on their shelves. 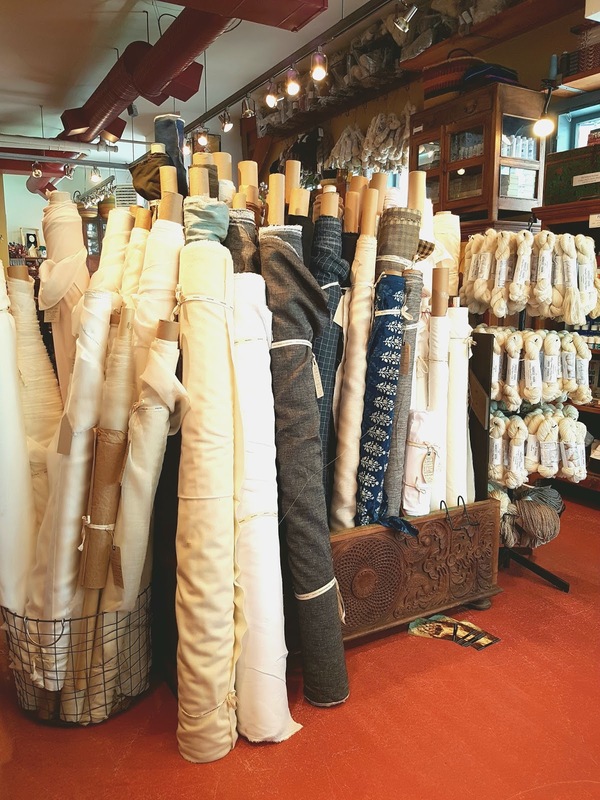 This store really is a part of the fabric of my life! P.S. bucket list- one of the immersive Maiwa trips to India- who wants to come with? Yesterday marked the first of May- and it's just so fitting that a movement such as Me Made May should be starting on May Day! The first of May traditionally marks the halfway point of Spring- also known as Beltane- an ancient celebration of longer days. In addition to being a celebration of Spring May first also marks a day when major shifts in the labour movementstarted to happen in the nineteenth century- for workers rights and freedoms- along with the eight hour work day! With Me Made May following on the heals of Fashion Revolution week this just feels all sorts of right- increasing workers rights and freedoms and striving to make the planet a healthier place. So with this in mind I am really excited to share some of my recent makes- as well as more fun outfit posts through out the month. As mentioned in previous posts one of my main goals as a maker is to seek out materials that are sustainably produced- which works considering my long term love affair with linen! Being cognizant of my material use and wastage is also on my radar- I want to use my materials in the most effective way and produce as little waste as possible. Now either I am an environmental warrior or just your run of the mill suburban fabric hoarder- either way I have a large collection of scrap fabric just chilling like a villain in my studio. While a part of me would love to have a clean minimalist studio free from all clutter and scrap this is just not the case so what is a girl to do? 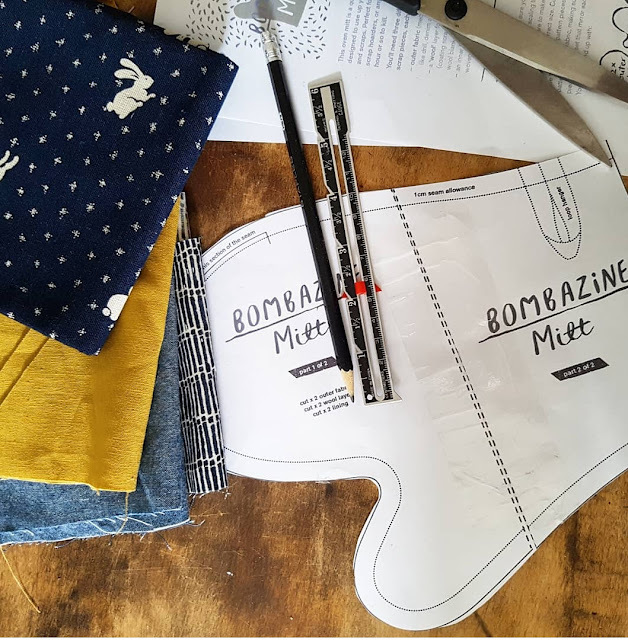 Enter in the Bombazine Mitt- a quick I.G. search will show all sorts of clever people using up their scraps in the most artistic ways- I was soon swept away by the scrappy possibilities! 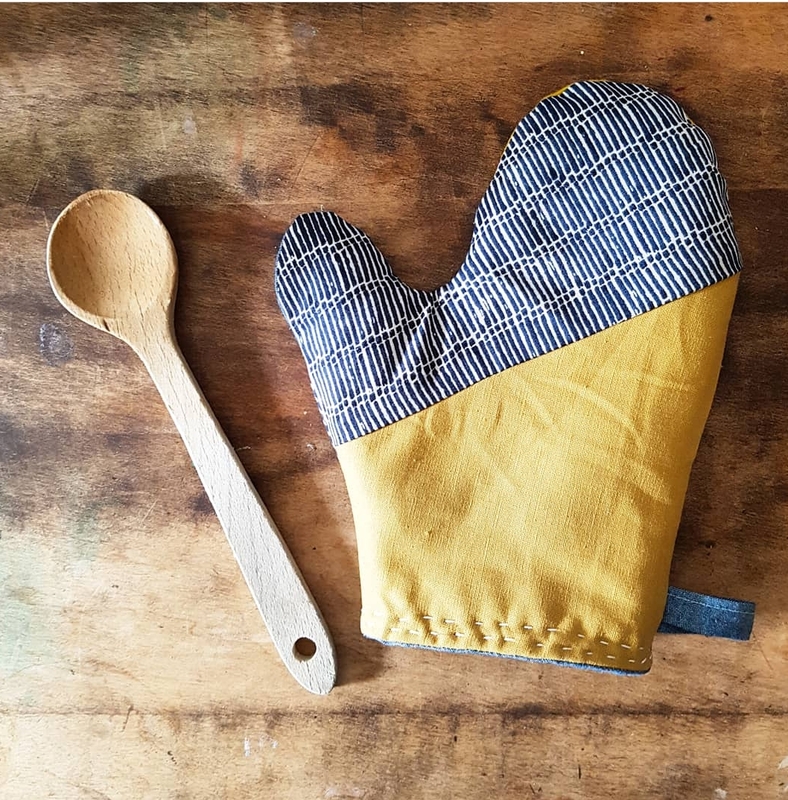 I am simply in love with this quick and easy little pattern- I may have made several of the oven mitts for myself all ready- who said Me Made May needs to be worn on your body. Oh and did I mention this is a free pattern? Oh yeah- no better way to my heart than something that is free and actually works! Check out Bombazine for other fantastic sewing inspo- there are several pieces I am now convinced to try for myself- up next the In The Folds Jumpsuit! Why is everything from Austrailia just SO cool? I'm always interested to see what other's are sewing and making- are you taking place in Me Made May? If so lets connect!